This tool shows a player's most recent stats at DraftKings, as well as his season averages, and his previous week's stats so you can compare these numbers and sort the columns all from a single page. Season averages are shown in bold, and a player's previous week's stats are shown in italics. This is another free tool with updated stats to help you analyze players and their DraftKings stats so you can draft a stronger team. First select the most recent week of games that have completed. And then choose a specific position, or leave it blank to compare all players. This is a nice feature because it allows you to find value across the different positions. Compare Wide Receivers to Tight Ends to find the overall stronger player at a cheaper price. Press Submit and the query will return the players and their most recent week’s stats, their season average stats, and the prior week’s stats so you can compare performance all on one screen. We also show the upcoming opponent, the opponent’s rankings, and whether the upcoming game is a home or away game. The columns in bold show season averages, while the columns in italics show the previous week’s stats. Also, all the columns are sortable! So rank the players in various ways to gain different perspectives. HINTS: Perhaps you want to rank the players by their DK Price/Pt to see their relative values based on the most recent game, but also then want to rank players by RushAtt + RecTgt to see how often they are targeted for the ball! You can also find potential great value by looking at the Next DK Price/Pt which divides a player’s upcoming DraftKings salary with the fantasy points earned in the player’s most recent game (lower number indicates greater value). Have fun analyzing the data and we hope this helps you draft a better team! DK Pts – DraftKings fantasy points scored from the most recent week. DK Salary – DraftKings salary from the most recent week. DK Price/Pt – DraftKings player salary price per fantasy point earned from the most recent week. Off Snap % – % of offensive snaps played in the most recent week. Rush Att – Number of rushing attempts in the game. Rec Tgt – Number of receiving targets. Rec – Number of completed receptions. RushAtt + RecTgt – The sum of rushing attempts and receiving targets this player had in the game. DK Pts Avg – Season average of DraftKings fantasy points per game through the most recent week. DK Salary Avg – Season average of DraftKings salary cost per week. Prev Off Snap % – % of offensive snaps played in the prior week. Prev DK Pts – DraftKings points in the week prior to this most recent game. Prev DK Salary – DraftKings salary in the week prior’s game. Prev DK Price/Pt – DraftKings player salary price per fantasy point earned from the most previous week. Prev RushAtt + RecTgt – The sum of rushing attempts and receiving targets this player had in the previous week’s game. Next DK Salary – Player’s DraftKings salary for the upcoming week. Next DK Price/Pt – Player’s DraftKings salary for the upcoming week divided by the DraftKings fantasy points earned from this past week. Don't Have an Account to DraftKings? 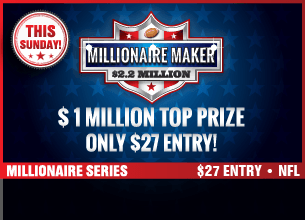 Start drafting a better team than your competition at DraftKings and win real money! Click here! Would you like to see a different type of query? Make a suggestion using our Contact Form!